Knoll Cottage, Kivernoll House Cottages in Kivernoll, Herefordshire sleeps 5 people. 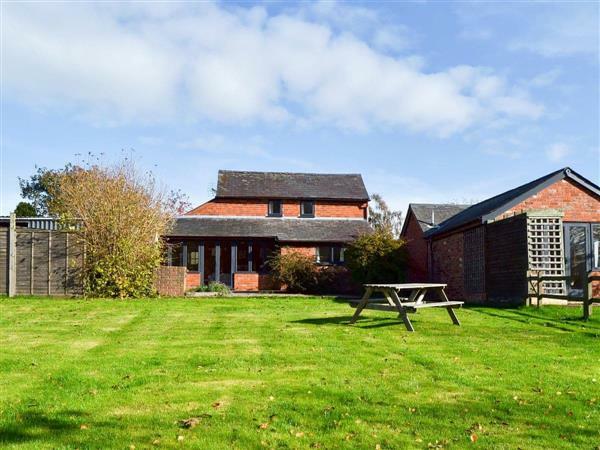 In an Area of Outstanding Natural Beauty, these fine 18th-century converted farm properties (refs QPQ, RBBF [Meadow Barn], RGF [Cwm Lodge]) are reached via a private lane. They enjoy a peaceful secluded setting in the countryside set in the 3-acre grounds of the owner’s home, which includes a landscaped garden, woodland area and paddock, along with micro pigs and pygmy goats. The holiday cottages each have their own garden and enjoy shared use of a six-seater hot tub. Ideally situated for exploring Hereford and the black-and-white villages to the north. Ross-on-Wye, the Forest of dean and the Wye Valley to the east, and Hay-on-Wye, the Brecon Beacons, Black Mountains and Offas Dyke to the west. Village pubs serving good food locally. Shops and pubs 2½ miles. Living room leading to modern kitchen/dining-room. Sun room with doors to patio. Twin-bedded room. Bathroom/W.C. with over-bath shower and bidet. First floor(with fitted stairgate): Double bedroom with en-suite W.C. Single bedroom. For a better idea of where Knoll Cottage is, you can see Knoll Cottage on the map below. Knoll Cottage is in Herefordshire; should you be on the lookout for a special offer, you can find all the special offers in Herefordshire. It's always worth checking to see what is on offer at the moment. Do you want to holiday near Knoll Cottage (QPQ), you can see other cottages within 25 miles of Knoll Cottage; have a look to find your perfect holiday location.